lt;stronggt;RCPAOT30SAGRPLlt;/stronggt;lt;BR/gt;Rubbermaid Crowne Collection Open Top Receptacle, Round, Steel, 30 Gal, Aluminum/greenlt;BR/gt;Give your place of business a royal touch. Contemporary style in textured powder-coated finish with brilliant aluminum accents. Fire-safe steel and aluminum construction. 12quot; diameter opening for drop-in convenience. Leakproof rigid plastic liner. Waste Receptacle Type: Open Top; Material(s): Aluminum; Application: General Waste. 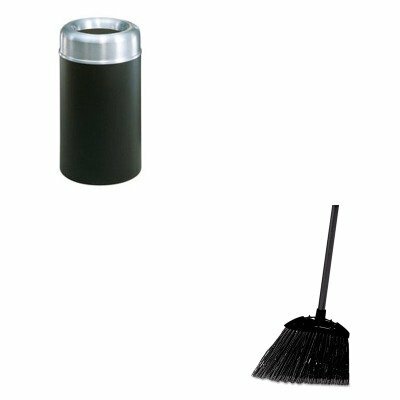 ~ Includes one waste receptacle.lt;BR/gt;lt;BR/gt;lt;stronggt;RCP637400BLAlt;/stronggt;lt;BR/gt;Rubbermaid Crowne Collection Open Top Receptacle, Round, Steel, 30 Gal, Aluminum/greenlt;BR/gt;Cut and shaped for easy sweeping in hard-to-reach areas. Flagged, acid-resistant polypropylene fill bristles. Will not stain, discolor or absorb odors. Can be used wet or dry. Overall length 35amp;quot;. Application: Spot Bristle Material: Polypropylene.